Dan was in the room when many interesting and exciting Wellington arts initiatives were hatched and for more than 20 years has stood behind, and slightly to the left, of some genuinely talented and gifted individuals as they have presented work. 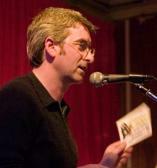 He is a former Chair of the Wellington Community Arts Council; founding trustee of the Fringe Arts Trust; former freelance publicist, production manager and producer of independent theatre; electronic ticketing systems expert and consultant; former General Manager of the Paramount picture theatre and ZMFM radio DJ. Dan is currently Fundraising & Special Projects Manager for Downstage Theatre; cinema critic for the Capital Times and ‘Nine to Noon’ (Radio New Zealand National); book reviewer for Nine to Noon; and for the last six years has been Wellington Manager for ‘V Energy 48 Hours Furious Filmmaking’ competition. Dan considers himself to be an evangelist, provocateur, enabler, facilitator, supporter and yogi for the arts and artists.